Nabarangpur-Online: Nabarangpur Cultural festival Mondei kicks off. Nabarangpur Cultural festival Mondei kicks off. The Mondei festival and Pallishree mela began here on Friday. The inaugural puja was performed at Maa Bhandara Gharani the presiding deity of this district. The rituals were performed at the temple to obtain the divine ordain (Agyanmala) of the deity. Chief guest SC and ST development minister Ramesh Chandra Majhi, Chairperson of district planning committee and local MLA Manahar Randhari, Chairperson of tribal development council Motiram Nayak, Chairperson of Odisha film development corporation Muna Khan, Dabugam MLA Bhujabala Majhi, Umerkote MLA Subash Gond, Chairperson of Nabarangpur municipality, Basanti Soura, chairperson of Umerkote municipality Pinki Agrawal, Collector Rashmita Panda, present at inaugural puja and procession. 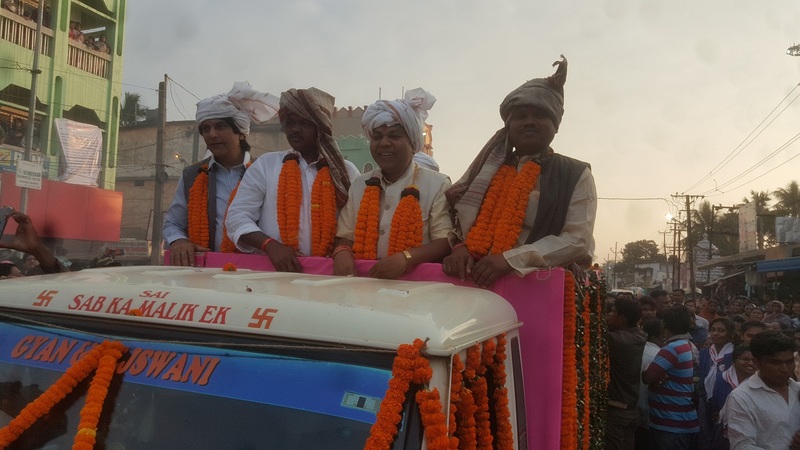 The colourful carnival procession moved to Mahatma Gandhi Marga, passed through the main road thoroughfares of the town and reached near the festival podium at Police ground. Besides the traditional folk dance troupes’ students from various schools, colleges and members of various outfits participated in the procession. The Mondei carnival reached Mondei Rangamanch in the evening. The symbolic Mondei Mahotshav Bima, Bhimani, were installed near the Mondei ground. Later Palishree Mela was inaugurated by the Chief Guest. Speaking on the occasion Minister Ramesh Chandra Majhi, said through Mondei, the district showcases the hidden talent and also reaches out to the people to create awareness about the different government schemes. It is an opportunity for the cottage and rural industries to display their products at a Handicrafts exhibition, Majhi said. Chairperson of district planning committee and local MLA Manahar Randhari, spoke different developmental steps of state government to improve health, education, transportation facility of this district. Nabarangpur MP Balabhadra Majhi, concern over the centers delay in Rail project and by-pass road of the town, he criticised the center’s attitude towards this backward district. Presiding the meeting collector and chairperson of district council of culture Rashmita Panda, said that ‘Mondei’ festival strives to proclaim the rich heritage of art, culture and tradition of Nabarangpur district. As many as eight cultural troups performed their dances in day one.Some of the attractions of the festival were Nepal folk dance, Chau, Gotipua Bihu and Sambalpuri dances forms. As many as 15 cultural troupes including tribal troupes were performed their dances. District Supply and Marketing Society (DSMS) is organising the five- day Pallishree Mela on the sidelines of the festival. This year, 200 stalls selling household articles, forest produce and food products have been set up at the mela.